This weekend has mostly been focused on fibre related activities. I did some spinning, but not enough to really make much progress. 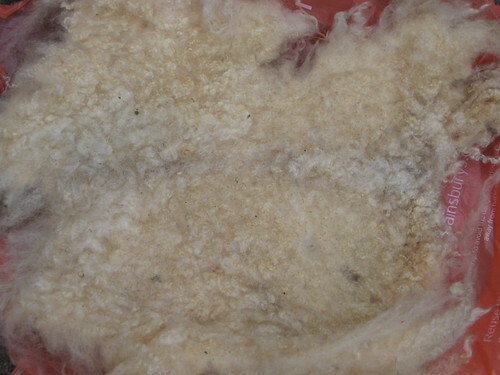 I washed the last of the first fleece. I worked a little more of the humongous doily. I knitted some sock. And I learned about 'picking'. 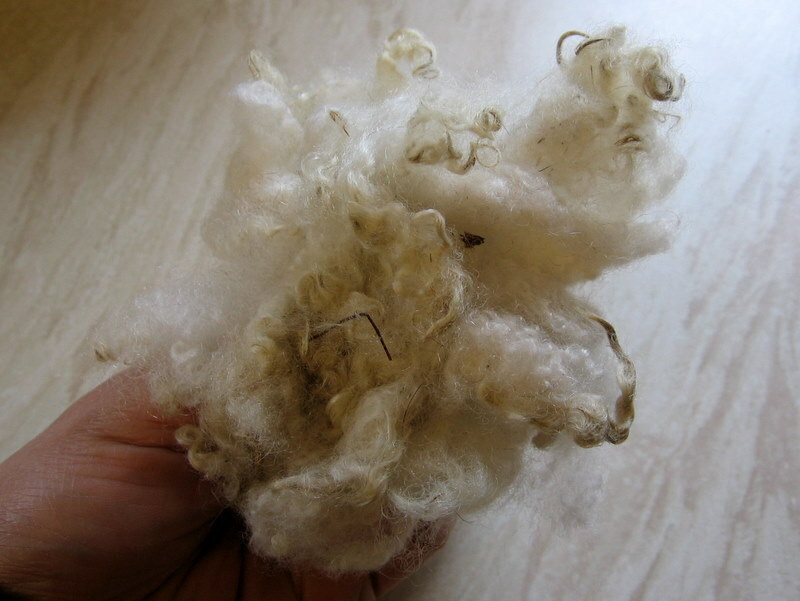 Picking fleece - sometimes called 'teasing' and others 'sorting' - is something I learned about from my spinning bible, a wonderful resource titled "Start Spinning" by Maggie Casey. 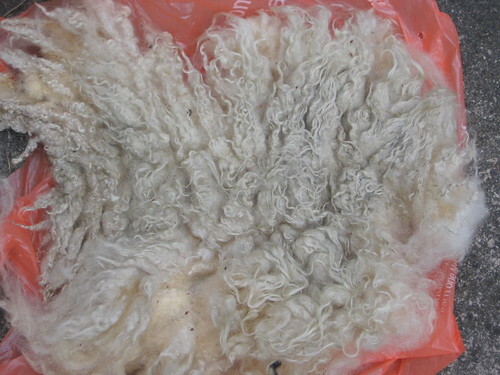 It's the process of picking the scoured fleece apart, loosening the fibres and removing all the 'undesirable' bits. 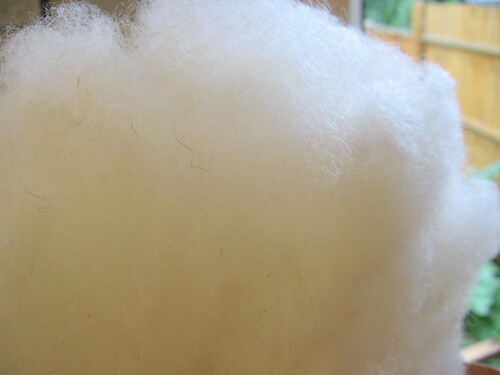 This prepares the fibre for carding, which in turn readies it for spinning. Apparently there are such things as mechanical pickers which will pick the fibres apart for you, but I've never seen one and certainly don't own one, so I'm doing this manually. After rather optimistically starting yesterday morning and thinking I'd have a nice bag full in no time at all, I've not made much progress at all. Maggie Casey warns "...A lot of people find teasing wool boring, and I will admit that I would never do it if I didn't get to spin the wool I had teased." And after having a go at this, I have to agree with the lady. I sat down with a handful of wool and began picking through it, loosening the fibres by pulling them apart and watching the larger pieces of debris fall out. Then came the problem, all of the little, tiny pieces of unidentified detritus which seems to be embedded in the tightly compacted fluff. To get at it, you really do have to pull the fibre apart a few strands at a time and this takes you into a sort of timeless zone where whole hours disappear without you noticing! Admittedly, I haven't spent the whole weekend doing nothing but picking but I've certainly returned to it whenever I wasn't doing anything more stimulating (i.e. not as mind numbing). I even got Dave to have a go, with him working through a couple of handfuls for me. After a good few hours work between us, we have maybe a third of small bag full of 'picked' wool. Once it's been washed and scoured, it looses the grease, becomes a lot nicer and softer to touch, but is still very compacted and full of undesirable bits. I'm impressed, but it sure is hard work and very time consuming. Dave and I were theorising that back in the day it would have been the kind of job that would be given to small children who have little nimble fingers. It isn't difficult, but requires persistence, a resistance to boredom and very good light. You are quite correct, children used to do this whilst the father knitted. Not sure who spun - the mother was doing the housework/washing fleeces.